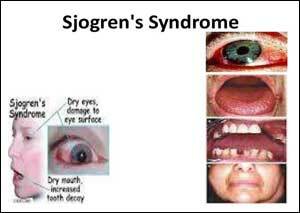 Primary Sjögren’s Syndrome (pSS) is a chronic, debilitating condition that warrants effective management. All patients should be counseled and offered topical management for sicca symptoms. Systemic treatment should be considered early in those with constitutional symptoms.British Society for Rheumatology, BSR has released its guidance for the management of primary Sjögren’s Syndrome which has been accredited by NICE.This guideline reviews the treatment of the glandular and systemic features of pSS. The management of the glandular features includes conserving, replacing and stimulating secretions. Systemic features may require system-specific therapy and immunomodulatory treatment. Holistic management is important and many patients benefit from non-pharmacological therapies and general support. Patients commonly present with a dryness of the eyes and mouth. In the early stages, they may complain of grittiness rather than dryness of the eyes, and the mouth symptoms may require prompting. Fatigue and arthralgia are almost universal. There is often a considerable delay between symptom onset and diagnosis. The most widely accepted current classification criteria for pSS and those referred to in this guideline are the American-European Consensus Group (AECG) criteria. The 2016 ACR–EULAR criteria have just been published derived from criteria proposed by the Sjögren’s International Collaborative Clinical Alliance (SICCA). The populations described by both criteria are very similar. For a definite diagnosis the AECG criteria require four out of six of dry eye symptoms, dry mouth symptoms, objective ocular dryness (Schirmer’s test ⩽5 mm in 5 min or van Bijsterveld score ⩾4), objective oral dryness (unstimulated salivary flow rate ⩽0.1 ml/min or positive salivary scintigraphy and sialography), positive anti-Ro/La antibodies, labial gland focus score ⩾1 including at least one of the last two objective features. The 2016 ACR–EULAR classification criteria are based on the weighted sum of five items and require a total score ⩾4 to meet the criteria for diagnosis where the presence of anti-Ro antibodies or focal lymphocytic sialadenitis with a focus score of ⩾1 score 3 each and where abnormal ocular staining score ⩾5, Schirmer’s test result of ⩽5 mm/5 min and unstimulated salivary flow rate of <0.1 ml/min score 1 each.